Did you know that children who don’t read over the summer actually forget what they’ve learned in school? And even worse, the effect can be cumulative. Kids who lose reading skills over the summer can find themselves well behind classmates who have incorporated books into their recreational activities. 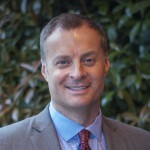 Couple this with the fact that there has been little or no improvement in what is being taught regarding personal finance in our schools, and it becomes imperative we find more creative ways to introduce and reinforce these concepts. Don’t despair: the ABA Foundation—along with our partners at First Book—have put together some book recommendations so that bankers can play a part in advancing financial literacy and academic performance by engaging youth in reading and reading-related activities during the summer months. The suggested titles are divided by recommended grade level, and several books are available in Spanish. You can link to the poster (shown in the graphic below, and you can download a copy at aba.com/teach) from your bank’s website, include in social media, make copies available to parents who are customers of your bank and share it with the schools or libraries you work with as part of your financial education outreach efforts. Books illustrate the importance of money skills through relatable stories, and are an excellent overlay to any financial literacy event. 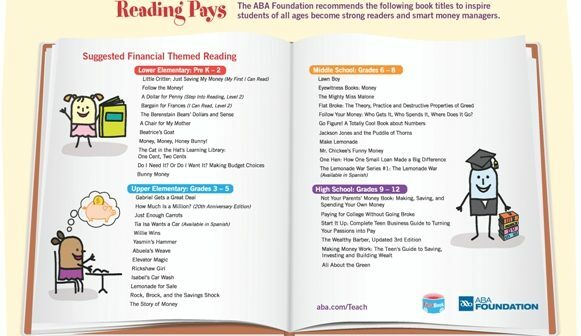 In December, the ABA Foundation announced its Book Award Program, an avenue for banks to donate financial education-related books as a part of their money skills presentations held in classrooms across the country. The program is open to banks of all sizes registered for the Foundation’s core financial literacy programs: Teach Children to Save, Get Smart About Credit and Lights, Camera, Save! A Book Award is much like a gift certificate. Banks that take advantage of this program will be able to select and donate finance-focused books to schools or programs that serve kids from low-to-moderate income families. The books can be delivered to the school or the banker can bring them along to distribute as part of a financial literacy lesson. Thanks to the generous support of Fiserv, a leading global provider of financial services technology solutions, the ABA Foundation will make up to 50 of the aforementioned Book Awards available to banks registered for any of the Foundation’s financial education programs. Because strong readers make better money managers, let’s instill a love of reading this summer.